His Holiness Patriarch Mor Ignatius Aphrem II presided over the meeting of the General Secretariat of the Holy Synod at the Patriarchal Residence in Atchaneh, Bikfaya – Lebanon. 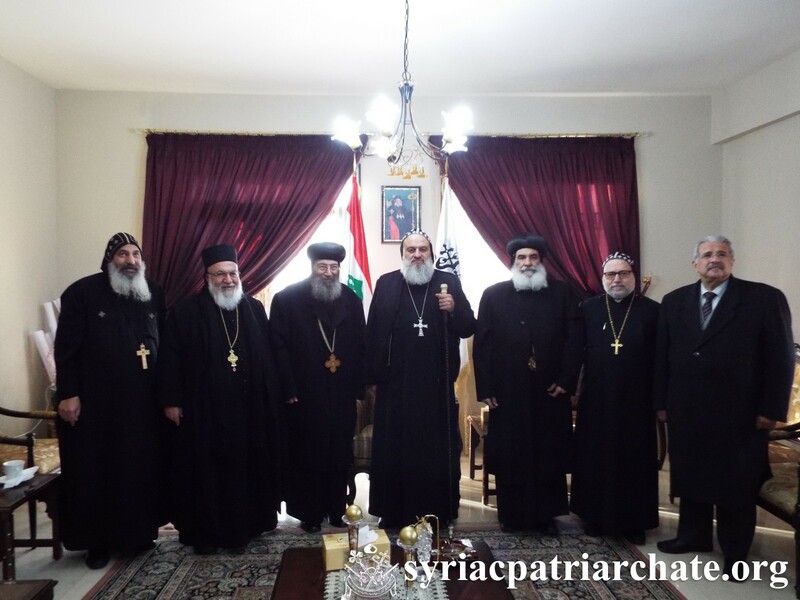 Mor Philoxenus Mattias Nayis, Patriarchal Vicar in Germany, His Eminence Mor Mor Dionysius Jean Kawak, Patriarchal Vicar for the Archdiocese of Eastern United States, Mor Nicodemus Daoud Sharaf, Archbishop of Mosul, Kurdistan and Environs, and Mor Timotheos Matta Al-Khoury, Patriarchal Vicar in the Patriarchal Archdiocese of Damascus, participated in the meeting. His Holiness opened the meeting with a prayer and then he discussed with their Eminences the different matters on the agenda. His Holiness Patriarch Mor Ignatius Aphrem II received a delegation from the Coptic Orthodox Church at the Patriarchal Residence in Atchaneh, Bikfaya – Lebanon. The Coptic Orthodox Delegation included the members of the Executive Committee of the Middle East Council of Churches: Anba Bishoy, Anba Benyamin and Dr. Guirguis Saleh as well as Rev. Fr. Rouwais AL-Ourashalimy. The meeting was attended by their Eminences: Mor Theophilos Georges Saliba, Archbishop of Mount Lebanon and Tripoli, Mor Philoxenus Mattias Nayis, Patriarchal Vicar in Germany, Mor Dionysius Jean Kawak, Patriarchal Vicar for the Archdiocese of Eastern United States, Very Rev. Raban Joseph Bali, Patriarchal Secretary and Media Office Director, and Rev. Fr. Jimmy Danho. His Holiness welcomed their Eminences and the members of the Delegation and discussed with them matters related to the special relations that exist between the two sister churches: the Coptic Orthodox and the Syriac Orthodox Churches. His Holiness conveyed his brotherly love and hearty wishes to His brother in Christ His Holiness Pope Tawadros II, Pope of Alexandria, Patriarch of the Throne of St. Mark, Head of the Coptic Orthodox Church. 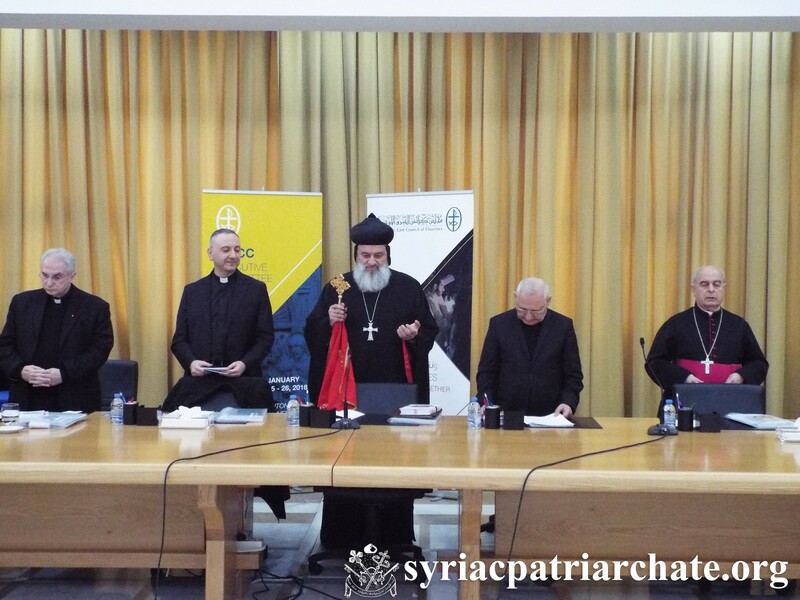 His Holiness Patriarch Mor Ignatius Aphrem II presided over the opening prayer of MECC Executive Committee session at the Antonine University in Baabda – Lebanon. His Holiness then lead the closing session of the Executive Committe in which various topics of common concern between the churches as well as matters that are in the scope of the MECC work were discussed. His Holiness Patriarch Mor Ignatius Aphrem II received Rev. Fr. Pablo Neves from Brazil, at the Patriarchal Residence in Atchaneh – Lebanon. During their meeting, Fr. Pablo submitted to His Holiness a copy of his new book for children in Portuguese. His Holiness congratulated Fr. Pablo for his work, and encouraged him to continue working on such projects that can bring children closer to God and the Holy Church and teach them the principles of Christian life. 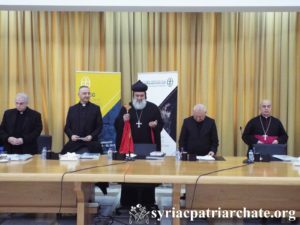 His Holiness Patriarch Mor Ignatius Aphrem II participated in the meeting of MECC Executive Committee at the Antonine University in Baabda – Lebanon. During the meeting, the participants election of Dr. Thuraya Bachaalani as Acting General Secretary for MECC. As President of the Middle East Council of Churches (MECC) for the Oriental Orthodox Churches Family, His Holiness Patriarch Mor Ignatius Aphrem II presided over the opening session of the MECC Executive Committee held at the Antonine University in Baabda, Lebanon. His Beatitude Mar Louis Rafael I Sako, Chaldean Patriarch of Babylon, and Rev. Dr. Habib Badr participated as presidents of their Church families. 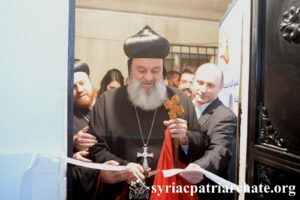 His Eminence Mor Theophilus Georges Saliba, Archbishop of Mount Lebanon and Tripoli, represented the Syriac Orthodox Church of Antioch in the Executive Committee. Rev. Fr. Jimmy Danho participated as the Associate General Secretary of MECC for the Oriental Orthodox Churches Family. His Holiness was accompanied by Very Rev. Raban Joseph Bali, Patriarchal Secretary and Media Office Director. On the occasion of the new year 2018, His Holiness Patriarch Mor Ignatius Aphrem II invited their Excellencies the Ambassadors, Charge d’Affaires and Diplomatic Representatives to a Formal Reception at the Patriarchate in Bab Touma. The reception was attended by His Excellency Mario Cardinal Zenari, Apostolic Nuncio in Damascus, His Excellency Dr. Faisal Mekdad, Syrian Deputy-Foreign Minister, as well as the ambassadors or heads of missions of various countries. His Holiness Patriarch Aphrem II welcomed their Excellencies and spoke about the current situation in Syria. He expressed his sorrows that the year 2017 was not good for the Syrian people, for it was a painful year full of sufferings; He hoped that in the new year 2018 peace will prevail in the country and all over the world. His Holiness urged the international communities to promote peaceful resolution in Syria. He also thanked the ambassadors and their respective governments for their solidarity with Syria, especially expressed by the presence of diplomatic representation and cooperation in Syria. 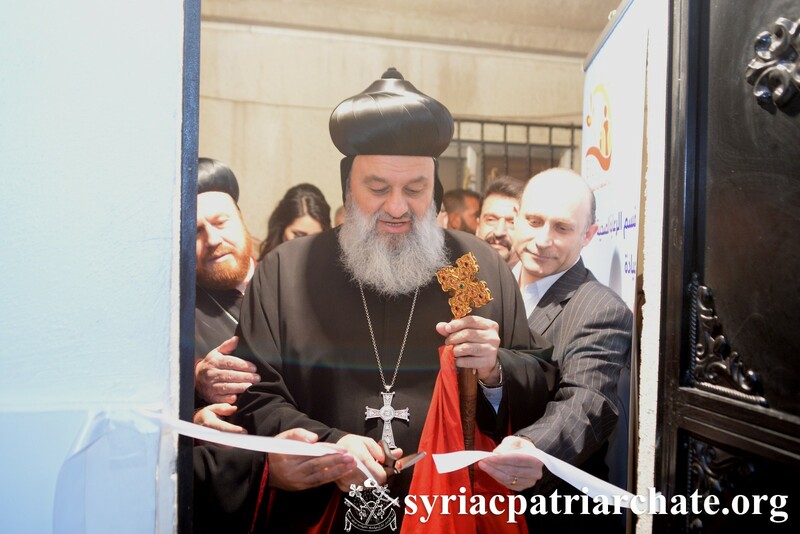 His Excellency Cardinal Zenari gave then a speech in which he emphasized the role of the church in rebuilding Syria, especially in building the hearts of Syrian brothers and sisters. Another speech was then conveyed by His Excellency Dr. Mekdad who reassured the fact that Syrians have equal rights and duties. He then spoke to the ambassadors saying that their presence means a lot for they are witnesses to what is happening in Syria. Their Eminences Mor Timotheos Matta Al-Khoury, Patriarchal Vicar in the Patriarchal Archdiocese of Damascus, Mor Timotheos Matthew, Patriarchal Secretary for Indian Affairs, and Mor Maurice Amsih, Archbishop of Jazeera and Euphrates, as well as the monks of the patriarchate also attended the reception. 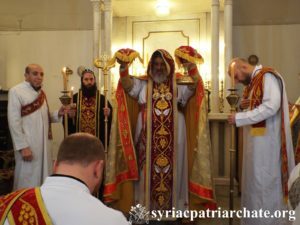 His Holiness Patriarch Mor Ignatius Aphrem II celebrated the Holy Qurobo of the third Sunday after Epiphany, at St. Georges Patriarchal Cathedral in Bab Touma – Damascus. His Eminence Mor Maurice Amsih, Archbishop of Jazeera and Euphrates, assisted His Holiness in the Qurobo. In his sermon, His Holiness talked about discipleship and how a person should be born from above. He also spoke about Nicodemus who came in the dark fearing to follow Jesus explicitly, and how we as Christians should not be afraid of declaring our faith, but boast, instead, in the Lord. Meeting with the Political and Media Adviser to the Syrian Presidency Dr. Bouthaina Shaaban. 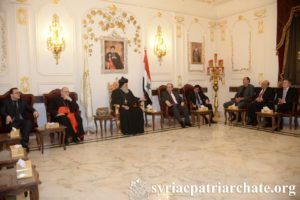 His Holiness Patriarch Mor Ignatius Aphrem II received Her Excellency Dr. Bouthaina Shaaban, Political and Media Adviser to the Syrian Presidency, at the Patriarchate in Bab Touma – Damascus. Her Excellency was accompanied by Mr. Moussa Al-Khoury, Executive Director of “Wathiqat Watan” association, and Mr. Saher Al-Hasheem, General Director of the International Civilization Center. During the meeting, Her Excellency introduced to His Holiness the “Wathiqat Watan” Organization and its work in the preservation and documentation the Syrian culture. The organization’s field of work include three major projects, one of which is the documentation of the Syriac culture and language. 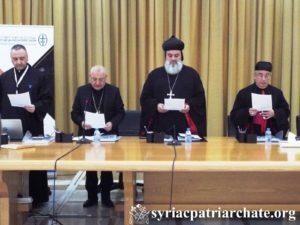 The meeting was attended by their Eminences Mor Timotheos Matta Al-Khoury, Patriarchal Vicar of the Patriarchal Archdiocese in Damascus, and Mor Maurice Amsih, Archbishop of Jazeera and Euphrates, as well as Very Rev. Raban Joseph Bali, Patriarchal Secretary and Media Office Director, and Deacon Imad Syryany.